Until now this painting has remained in my personal collection. Prince Phillip, a friend of the Aisher family, often sailed the Aisher yacht “Yeoman XXVIII” in the popular Sigma 38 class. 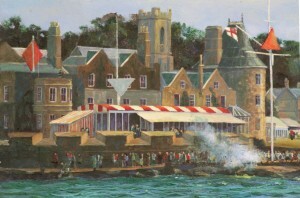 Over the years, many of the royal family have supported and raced in Cowes Week. Prince Phillip has been a notable supporter of Cowes Week, contributed many ideas and made useful contributions to the development and popularisation of this prestigious event. I deliberately sought out the yacht with the help of a Cowes boatman. I discreetly photographed and sketched her, press being actively discouraged from photographing ‘royals’ during their vacation at Cowes week. 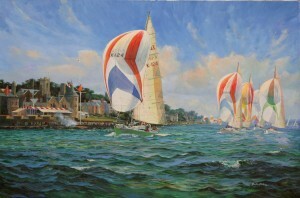 A mere seven yachts entered the first organised yacht race at Cowes on 10th August 1826. For many reasons some geographical, some social and so on. 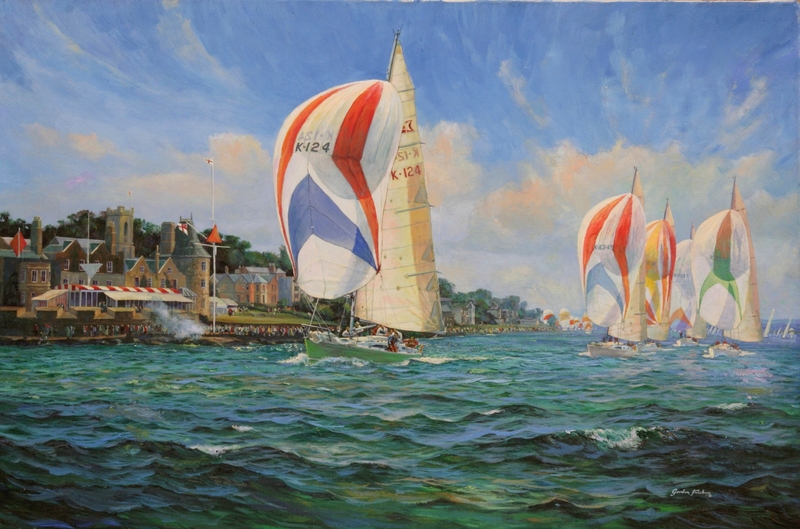 Cowes Week (early August) is today the World’s premier sailing regatta, with almost 2,000 yachts and dinghies and 12,000 competitors joining in ranging from beginners to some of the world’s best. Cowes Week has a much to offer and attracts a wide range of competitors from amateurs, celebrities to Olympic and World champions. Cowes Week has a huge amount to enjoy both for sailors and visitors ashore with an exacting racing schedule and a packed social entertainment itinerary on shore throughout the event. A visit to Cowes during the regatta is a recommended experience, with its great selection of specialist shops, restaurants with a superb choice of cuisine, excellent line-up of live bands and more, all helping to create a festival atmosphere. Gordon Frickers © 17,08,02, Updated 01.08.2011, 31.08.15, 18.08.2017.